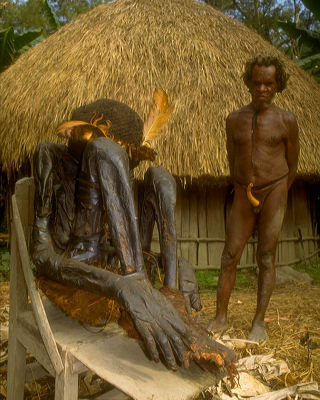 The smoked mummy of Pumo, formerly chief of the village, is normally kept in the men's hut but was brought outdoors for this photograph. The current chief stands in the background. This photograph is available as an 11x14" signed print, archivally mounted and matted or archivally framed in black metal.